"He recibido el producto bien protegido, servicio rápido y total seriedad." Citrine druse with unusual format. This citrine druse has a very different format, its profile has an L shape and its edges are cut straight allowing the agate matrix to be visible. Procedence: Brazil. Weight: About 3,880 kg. Approximate measurements: 18 cm x 11.5 cm x 14 cm. ONLY PIECE. Citrine quartz druse from Brazil. Citrine druse with approximate measurements of 17 cm x 17 cm x 9.5 cm and weight about 3,180 kilos. It is a unique piece of great beauty and vibrant yellow tips. Origin: Brazil. ONLY PIECE. Brazilian rough citrine druse with cut base. It is a citrine druse from Brazil, 18 cm high with cut base. 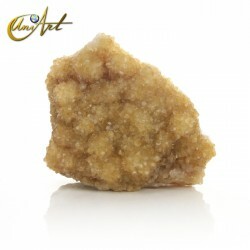 The crystals of this beautiful citrine druse have a nice yellow color. Approximate size of the citrine druse: · Weight: 3,140 kg. · High: 18 cm. · Width: 17 cm. · Thickness: 10 cm. ONLY PIECE. Citrine druse of small crystals on a quartz matrix. It is a big druse of citrine with 4.8 kilos that measures around 26 cm x 18 cm 12 cm. It has a lively color and an original format and can be seen how the small crystals of citrine cover the quartz matrix like a mantle. From Brazil. ONLY PIECE. Citrine druse with polished base. This beautiful and gig citrine druse, has big crystals of vivid orange. It is a large piece covered with very bright tips. Average size of the citrine druse: · Weight: 7.700 grams. · High: 18 cm · Width: 23 cm · Thickness: 14 cm · Procedence: Brazil. ONLY PIECE. Citrine is a gemstone of the quartz family, yellow, whose name comes from the Latin word "citrus", lemon. Its color can change from pale yellow to orange tones. This gem has a hardness of seven on the Mohs scale. The process of formation of the citrine quartz occurs when the violet of the amethyst is so pale that loses its value as a gem. Because of this effect, the use of citrine has become more common. The countries that exploit this procedure to obtain the citrine stone are Uruguay and Brazil. Natural citrine is hard to find, so to get a similar stone the amethyst is heated. The violet amethyst is considerably more common. 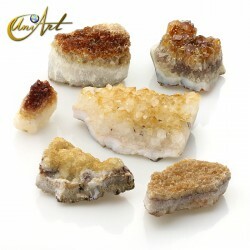 However, we have a wide selection of citrine within the citrine geodes category.